Westfield Football Club ended its season with a third victory in four games. A late goal from Terry Robinson gave the Westies a 1-0 win away to Rottingdean Village in Southern Combination League Division Two on Saturday. Westfield chairman and defender Jack Stapley said: “It was probably one of our most comfortable results of the season even though it was only 1-0. The extremely strong wind put paid to any decent football being played and any kicks from the goalkeeper going away from the changing rooms would invariably bound through for a throw-in or goal kick. Westfield huffed and puffed, but for most of the game lacked a finishing touch. 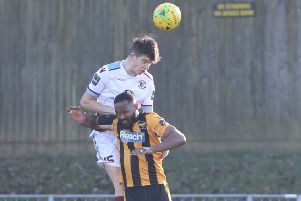 George King might have had a hat-trick, twice heading wide from inviting positions, and Asher Grindle also missed the target when well placed. But the visitors got there in the end. A lovely ball through from Grindle found Robinson, who took a nice touch before finishing into the bottom corner in the 86th minute. Although Rustington blazed one opportunity over the crossbar from 10 yards, Westfield goalkeeper Perry McNamee didn’t have a great deal to worry about as he kept a second clean sheet in three games. Sam Winter was back in Westfield colours and had a good game at centre-half. Westfield: McNamee; McGurk, Histed, Winter, Bell (Durrant); Charlton (Cochrane), Ferguson, Davis; Grindle, Shelton (Robinson), King. Although disappointed with their league position, Stapley is pleased with the football club’s form during the second half of the season. The Westies are currently seventh and may drop to eighth or ninth by the time the teams just behind them have finished their games. But they did at least win seven of their 13 league matches since the turn of the year, including two victorious against top four clubs, as well as drawing away to champions Rustington. Stapley said: “I’m very disappointed with where we’re going to finish. With the side that we’ve had and the way that we’ve played against the so-called bigger teams, I think it’s really disappointing to finish that low. But we didn’t have any consistency in the team from September to December. “But the end of the season has been a real positive. I think if the league started in January, we would probably be in the top three or four. “Everyone’s pulled together and we’ve had some really good results. We’ve proved that we can mix it with the big boys, but we’ve got to get some consistency through the whole season. It’s getting that same side out every week. “Hopefully everyone sticks together and we can build on from January onwards. We’ve certainly stuck by many players and I would hope most of the players will stick around. “I think we will probably had a few more next season from Stars FA; they’re very good players and they’re keen to play adult football. Stapley added that his dad Mark Stapley is keen to carry on as manager for next season.